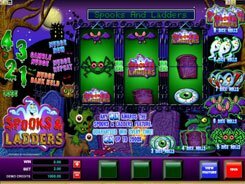 Phantom Cash is a ghost-themed 5-reel slot with 25 fixed paylines. 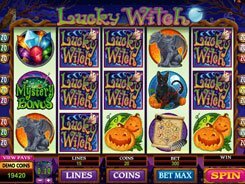 The symbols set includes four ghosts, two ghost catchers (Thurmingham and Carstairs), the Haunted House and playing card symbols. 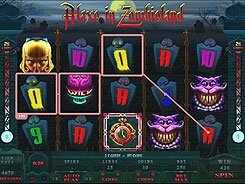 The game features two wild symbols, a scatter and the Ghost Zap bonus game. 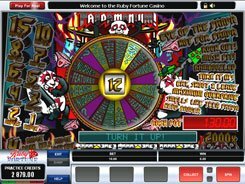 A total bet per spin can be adjusted from $0.25 to $125, and playing at max you can grab the slot’s jackpot worth $12,500. The two wild symbols, Thurmingham and Carstairs, land on reels 1 and 5 only. They substitute for other non-feature symbols and double the payout when substituting. 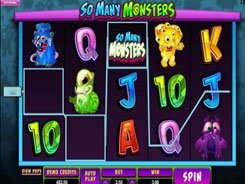 Three Haunted House scatters trigger the Ghost Zap bonus feature; that is, in fact, a free spins feature that continues until you catch eight ghosts. 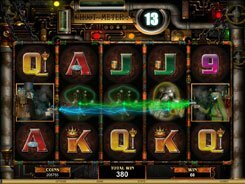 The number of ghosts left to be zapped is shown in the Ghost Meter above the reels. A ghost is caught when it lands on the same row as any of the ghost catchers. For every successful catch, you get a win of your triggering bet multiplied by x2. The Ghost Zap feature ends when the Ghost Meter reaches 0.